Violins have been a centerpiece of my family for at least the past three generations. My patriarchal grandfather and his eight brothers all played the violin. My matriarchal grandfather was a finish carpenter, and his brother both made violins and taught violin lessons. I’ve always loved musical instruments, and early on taught myself to play both the banjo and guitar. I’ve also always loved working with wood. 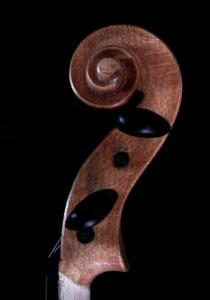 Two significant life events turned my passion to making violins. First, I inherited three of my great uncle’s violins and an ancient book on violin making techniques, measurements, and tuning. The violins were in a state of disrepair, so I followed the directions in the book and brought them back to their original condition. During the process, I taught myself to play the violin. Second, while cleaning out my mother’s basement, I found her father’s tools that had been sitting idle in his hand made tool boxes for over 40 years. The tools date back to the late 1880s, when all fine woodworking was done by hand. After a time, I became critical of my grandfather’s finish work. His measurements were accurate, but his detailing was only fair. The violin has always appealed to me as being colorful, sculptural, and a working piece of art. I was determined to improve upon his work, and during each painstaking, 3-4 month process it took for me to turn a piece of raw wood into a violin I did just that. In the mid-1990s, a violin society I was involved with introduced me to the work of Dr. Carleen Hutchins www.catgutacoustical.org/people/cmh/index.htm and her use of Chladni patterns to tune the individual wood components with an assortment of electronic equipment prior to their assembly. By tuning each hand made piece before assembling them together, the sound conducted by each resonates as one. I was honored to be given one on one instruction from Dr. Hutchins for two years at her home allowing me to infuse the precision of my woodwork, with the sound and soul of a Master. I invite you to see and hear for yourself.